The winner is Cassidy! Congrats! And thanks to everyone who entered. Looking to tone up for summer? There are cute bikinis, midriff baring tops and short shorts to wear, after all. Well, here’s that Barre Beautiful giveaway that I mentioned a few weeks ago! The prize is a two-week pass to classes at Barre Beautiful (learn about the workout’s benefits here). If you’re super keen, you can try a different class every day, or do back-to-back classes. I am taking classes there, too, so may even bump into you there (definitely say “what up!” if so!). Like the Health & Swellness page on Facebook and write “I want a Barre Beautiful body.” on the Barre Beautiful giveaway post. Giveaway closes Wednesday, May 22 at midnight (EST). The winner will be chosen at random and announced on Health & Swellness. Enter away, my pretties, and good luck! I struggle when it comes to including more to my fitness regimen than running. And although I may have found another cardio workout I could excel in (tee hee), I really do need to add strength training, core work and stretching into the mix. 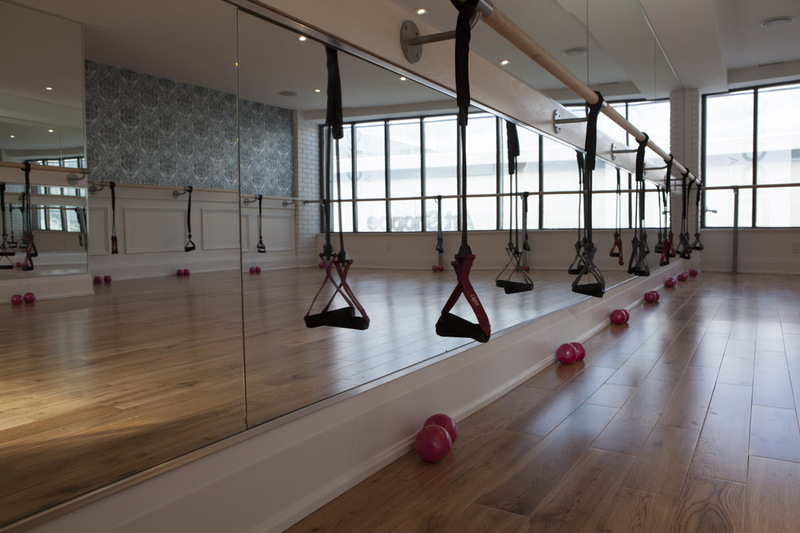 So I tried out a Classic Barre class at Barre Beautiful and had a chat with the studio’s founder Voula Floros about the workout. Here’s what I discovered. A barre class will not make me or you into a ballerina. “It’s not a full ballet class. A portion of the class is similar to the barre work that a ballet dancer would do when beginning a class–the exercises that train the dancer to dance. We don’t really get to the dance part except for in our Adult Ballet class and our Barre Moves Class,” says Voula, who is a certified fitness instructor. “Our workout takes classical dance ‘training’ moves and fuses them with Pilates moves and principles (Pilates and dance have always been closely linked as many dancers practice Pilates) to create a workout that focuses on building muscular strength control and endurance and increasing flexibility. Our exercises focus on lengthening and extending as you work. Targeted muscle work—micro-contractions and isometric contractions that strengthen and tone muscles not typically used in exercise. While one’s ballerina dreams won’t be coming true, everyone can benefit from a barre class. “The benefits include increased mind body awareness, postural improvement, enhanced range of motion and movement, weight management or loss, muscular endurance and improved coordination, stress release, improved cardiovascular health and increased bone density are just a few of the benefits that a barre workout offers,” says Voula. “The workouts are also low impact so easy on the joints and perfect for participants with special considerations. A runner, hockey player, a triathlete, a weight lifter or even a yoga follower can all benefit. Exercise science and studies have proven that the more varied our exercise activities the better our overall health and the more effective our workouts,” she says. Why everyone’s hitting the barre nowadays. “Fitness is constantly evolving, and workout methods are constantly changing, as we learn to train more effectively, efficiently and safely. Barre workouts are a product of this evolution. Fusing one of the most classic forms of movement, ballet, with one of the most biomechanically sound fitness approaches, Pilates, to create an amazingly effective, sound and even romantic form of exercise,” says Voula of the popularity of barre workouts. Want to try classes at Barre Beautiful? Stay tuned for a giveaway on Health & Swellness!